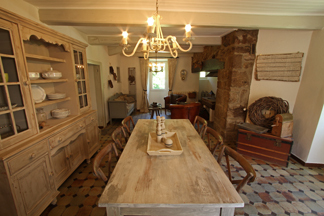 Be at home in the Ardèche! Area: 80m². Two spacious bedrooms and a nice living room, bathroom and kitchen. Several things are currently renovated, and the bathroom and kitchen are brought up to date. Prices include bed sheets, set of towels per person, set of dish towels/hand towels/tea towels, and tourist tax. Additional bed sheets € 8.00 per person, towel package € 6.50 and hand-tea-dish towel package € 5.00.